What kind of lung function tests are there and what do they involve? Lung function tests (also called pulmonary function tests, or PFTs) measure how well your lungs work. Most of the tests involve measuring how much air you can breathe in (inhale) and breathe out (exhale). For instance, if you exhale much less than the normal volume of air in one second or still have too much air in your lungs after exhaling forcefully, it may be a sign of lung disease. Lung function tests can also help to follow the course of a lung condition. As well as measurements of your ability to breathe in and out effectively, the oxygen content of your blood can be measured to see how well your lungs are working. When are lung function tests needed? in order to prepare for surgery. And they can be used to monitor the treatment outcomes and the course of chronic lung diseases like asthma or COPD. They are sometimes part of employee health check-ups too, or used in sports medicine. How can you prepare for the test? There is no need to prepare for a lung function test. It doesn't hurt or have any side effects. But you shouldn't smoke right before the test, and you should make sure you don't eat or drink too much. If you need medication, such as an asthma spray, it is best to first ask the doctor whether you can still use it as you would otherwise. Spirometry is the basic test used to measure lung function. It can be performed by either your family doctor or a specialist. The test measures the amount of air you inhale and exhale, and how fast the air is breathed in and out. You do this test while in a seated position. After taking a few normal breaths, you exhale into a mouthpiece as forcefully or as long as possible, depending on what the examiner asks you to do. Its important to follow their instructions carefully to ensure the best results. Your nose will be pinched with a nose clip to prevent you from breathing through your nose. 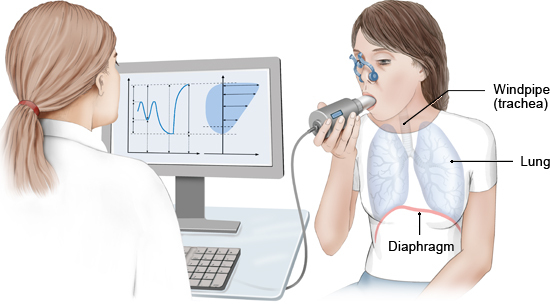 The mouthpiece is connected to a device called a spirometer. This device measures the amount of air you inhale and exhale when you breathe. The measurements are then displayed as a graph on the device's monitor. The test takes just a few minutes to complete. If other tests are done too (see below), it could take between 30 and 90 minutes in total. Spirometry can help find out things like how narrow the airways are in someone who has asthma, or determine how severe lung hyperinflation is in pulmonary emphysema. Whole-body plethysmography (also called body plethysmography) can deliver more exact results and additional information. This test is usually only done by a lung specialist (pulmonologist). It involves sitting in an airtight chamber and breathing in and out of a mouthpiece, like in the spirometry test. When you breathe in and out your chest moves up and down, causing the pressure inside of the chamber to change. The changes in pressure are used to determine the amount of air you inhale and exhale, and also the amount of air that stays in your lungs (residual volume). Even when you exhale as hard as you can, a small amount of air remains in your lungs. Airway resistance is also measured. This goes up if the path through the bronchi is narrowed, for instance by asthma or COPD. You don't need to breathe as hard as you can for this measurement. Normal, calm breathing is enough. This procedure takes a few minutes and is slightly more elaborate than spirometry. Since the measurements rely less on the active participation of the person being examined, it is suitable for young children too. Ergospirometry: Your lung function can also be tested while you are physically active - usually while on an exercise bike. This shows whether, for example, coughing or shortness of breath are exercise-induced or become worse under physical stress. Bronchial challenge test: In this test you inhale small amounts of allergy-triggering substances. If your lung function worsens as a result, it is a sign that you have an allergy. Reversibility test: In this test you inhale medicine to open your airways (a bronchodilator). If lung function improves as a result, it is likely to be asthma, rather than COPD or chronic bronchitis. Lung diffusion capacity test: This test is used to check the exchange of oxygen and carbon dioxide between the lungs and the bloodstream. During the test you inhale specially prepared air that contains a safe amount of carbon monoxide (CO). It is possible to tell how well oxygen and carbon dioxide are exchanged based on the amount of CO you exhale. Pulmonary fibrosis, for example, makes this exchange less effective. What is peak flow and how is it measured? This test allows people with a diagnosed lung disease to monitor the condition on their own. To perform the test, you hold a portable measuring device called a peak flow meter horizontally in front of your mouth. You inhale, hold your breath, and then exhale as forcefully as you can while keeping your lips tightly sealed around the mouthpiece. The maximum speed reached while exhaling (the "peak flow") is recorded by the device. This test is supposed to be done once or twice a day, taking up to three measurements each time. The highest value is then recorded each time. The peak flow meter must be completely dry when it is used , and it needs to be cleaned regularly. If one of the measured peak flow values is very different, you can seek medical advice or – if you have had patient education to learn how to do so – adjust your medication yourself. What is blood gas analysis? Blood gas analysis is used to measure the amount of oxygen and carbon dioxide in your blood, among other things. This makes it easier to judge how severe COPD or an acute attack (exacerbation) are. Because oxygen-rich blood is needed for this test, it is not taken from one of the usual places like a vein in your arm or hand, but from your earlobe (using a lancet). This blood, called capillary blood, has oxygen levels similar to those of blood from the arteries, but it is easier to sample. In specific situations, such as when monitoring artificial ventilation or in circulatory shock, the blood is taken directly from an artery in the wrist or thigh. Once the blood sample has been taken, a pressure bandage is applied to the wound to prevent bleeding. Bernstein WK. Pulmonary function testing. Curr Opin Anaesthesiol 2012; 25(1): 11-6. Bösch D. Lunge und Atemwege, in: Steffel J, Luscher T. Module Innere Medizin. Heidelberg: Springer; 2014. Helmholtz Zentrum München, Deutsches Forschungszentrum für Gesundheit und Umwelt. Lungeninformationsdienst. Lungenfunktionsprüfung.